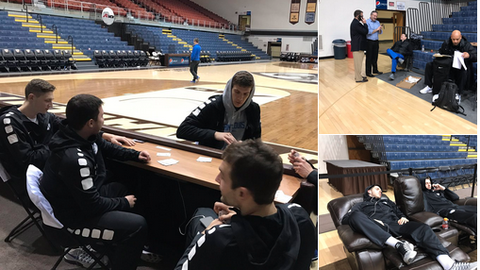 The Saint Louis University men’s basketball team lost a game to St. Bonaventure — and then its bus. The Billikens walked out of the arena Wednesday night following the team’s 70-55 loss to the Bonnies, and their bus was nowhere to be found, said New York State Police Trooper James O’Callaghan. The driver, later identified as 56-year-old Linda Edmister of Gasport, New York, had taken off. While authorities searched for the bus, the players sat in the arena. The team posted pictures on Twitter of players talking on their cellphones, playing cards and napping. “Just chilling in the Reilly Center while we try to find our missing bus,” the team tweeted. State police said the bus was eventually stopped in Randolph, about 40 miles from the arena. Troopers said they were able to find it through GPS on an item left on the bus. School officials said the item was coach Travis Ford’s iPad. “I’m not sure where their destination was after that. But yeah, it definitely wasn’t Randolph,” O’Callaghan said. Troopers charged Edmister with driving a commercial vehicle while intoxicated. Police say her blood alcohol content was 0.22 percent, more than five times the limit for commercial drivers (0.04 percent). As for the team, it later posted an update on Twitter thanking the St. Bonaventure staff for helping out. UPDATE: Our bus has been located. Thanks to @TKAthletics and the St. Bonaventure staff for the help. O’Callaghan said police don’t believe Edmister was drunk when she drove the team to the arena. He said troopers don’t know exactly when she left the campus or why. The game ended around 9:30 p.m. Edmister was pulled over shortly before 11 p.m., troopers said. Another bus took the Billikens to Randolph so team members could retrieve their possessions from the first bus. They were then taken to the airport in nearby Bradford, Pennsylvania, for the return flight, which arrived in St. Louis around 3 a.m. local time.